Savoy Hotel The Dansant and the keeping of doves. 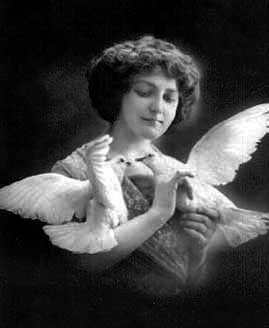 Sylvia holding the doves which Jeremy presented to her as a symbol of his total devotion upon the occasion of their first speaking at a Savoy Hotel thé dansant. Sylvia was said to be 'touched by the gesture' but 'appalled by the staining'. The doves soon refused to be parted from her. She and Jeremy would take an afternoon stroll through Hyde Park, chatting animatedly about his researches whilst a dove perched on each of her outstretched arms. Throughout their extensive peregrinations other birds, encouraged by the sight, would be tempted to alight upon her until she resembled 'nothing so much as a ledge at St. Pancras Station', as Jeremy was later to describe the scene to his friend Guscott. On one occasion, he recounted, she carried forty birds on each arm such that 'her arms gave way and their squawking drowned me out. The soiling was astounding'. But this period of happy intimacy was destined to be curtailed by the jealousy of Jeremy's older brothers who 'could not stand happiness or laughter in any form'. One day the doves disappeared inexplicably and the following morning Sylvia received an enormous and freshly-baked pie from Jonas bearing the inscription: "The Selman-Troytt family wishes you well in the search for your lost pets" picked out in short-crust pastry. Henceforth she returned Jeremy's billets doux unopened.